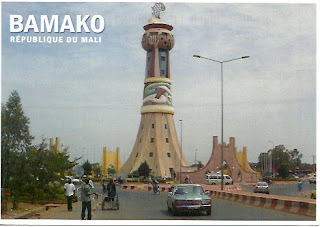 Africa-Mali-Timbuktu As you can see there are many ways to spell the name of this famous city. This card is unique in all the cards that I have in my collection and the reason is??? I have not been here ! 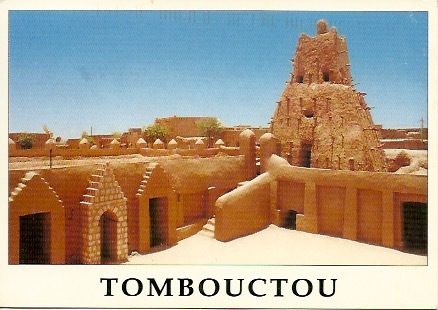 It is the only card I have of a place that I have not been. So why is it here. Well on my recent trip to Mali , my guide Abdouleye is from Timbucktu. He was a excellent guide . He was fascinated by my passion with postcards and visiting Post offices. As he would say " Ive never met someone like you Mr David " . Not the first time I have heard that. I had wanted to go the Timbucktu but due to security issues and no commercial flights it was not possible. So I seen this card and the Guide offered to mail it for me. But I know that when the situation is ok on the ground I will indeed visit. Here is the postmark Timbouctou dated 10 November 2017. 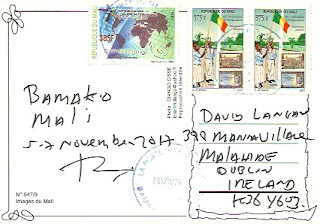 The writing is mine , but I did not put the stamps on the card. I rarely put stamps on top of stamps unless I have no space. 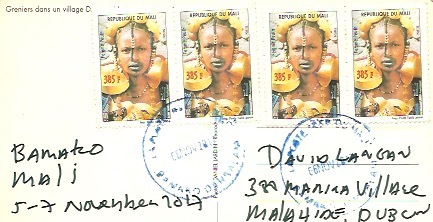 In Mali this is quite common as the Post offices often only have low value stamps for sale. Africa-Mali-Bamako My last card from Bamako . Here you see a typical scene from the city. 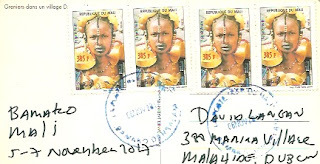 Sent from the main Post Office in Bamako , the office with the Philatelic section. 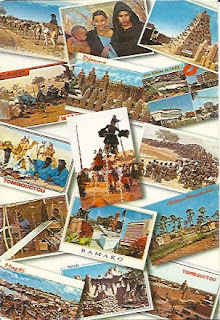 Africa-Mali-Bamako I just love this card. I could not resist it will all the old postcards on the front. Reminds me of years ago when everyone who travelled sent postcards. Hardly anyone does.. I do as you all know.. The first Post office I went to in Bamako. They have very few stamps of choice. I asked for the Philatelic Office and was sent to another Post Office. In this office I was brought into a room and told the Head of the Office I wanted to buy a selection of stamps. She understood what I was asking. So she opened the great safe and there was a lot of different stamps. You can see some of these on my cards. However when I was paying she asked for more as "Philatelic Stamps" had a 25% surcharge. This was after I had stuck them on my mail.. So as you can imagine a big fuss happened. In the end they did not charge the extra. But I did give the Lady in charge a small tip, as I was afraid my mail would go into the bin.. It did not as you can see and these are the results. Africa-Mali-Bamako These houses styles are some we seen on our trip in Mali. 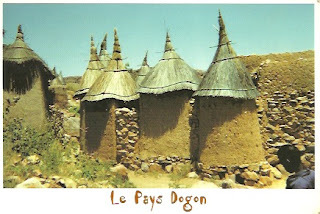 They are in Dogon area of Mali. Loved walking in the villages with the locals. I posted this card in Bamako , reason being is that were I purchased the card after I left the Dogon area. Postmark is hard to read.